We love National Parks! We are in western North Dakota on I-94. 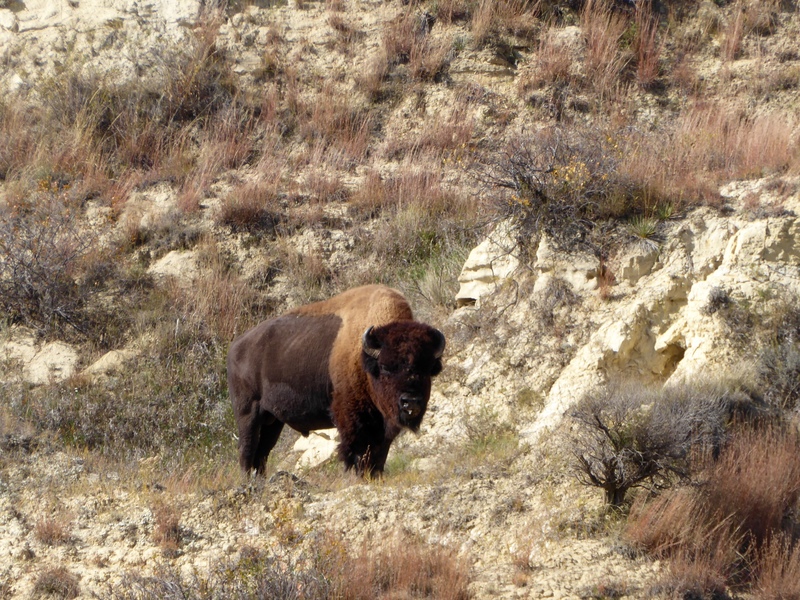 Theodore Roosevelt National Park is here. 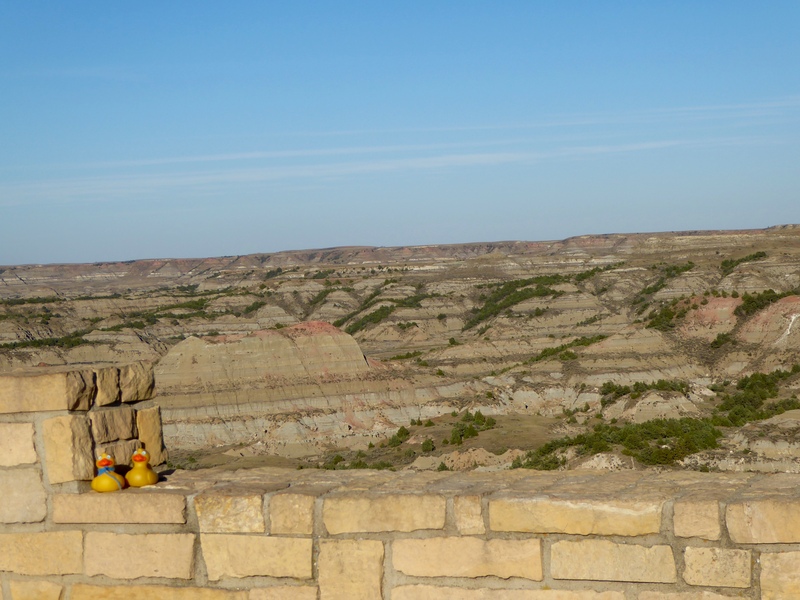 First we stop at the Painted Canyon Overlook. 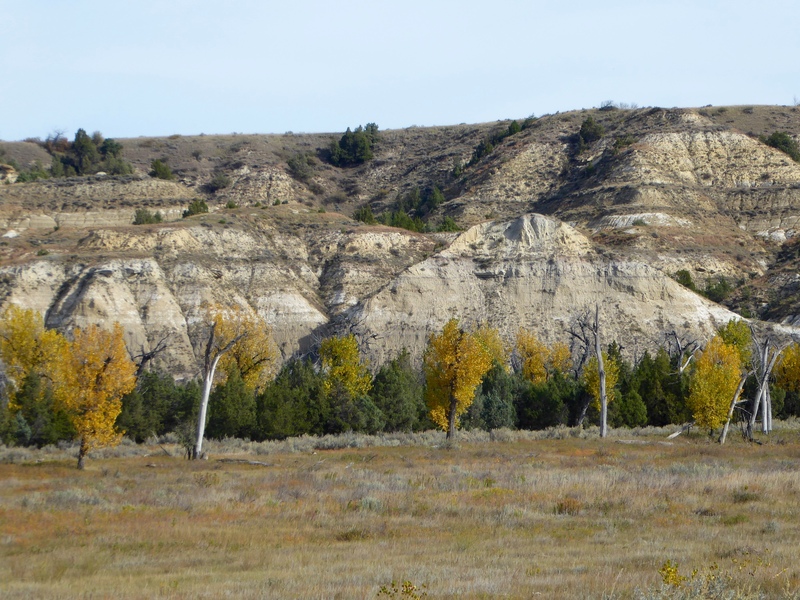 This is part of the North Dakota Badlands. The pink shows why this is called a painted canyon. This place takes your breath away. Don’t you just love it? 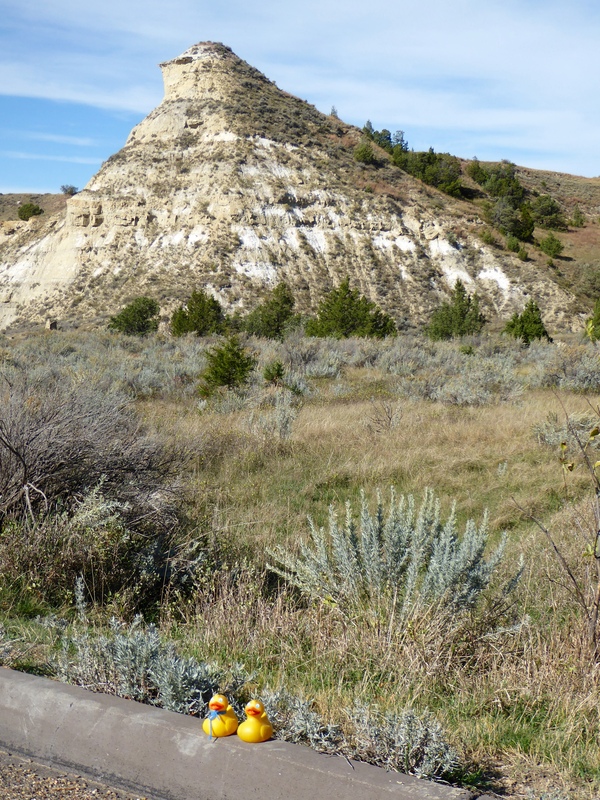 Next we went to the Visitor’s Center, received our map, and drove through the South Unit of Theodore Roosevelt National Park. First stop is the Little Missouri River Bottomlands. Very pretty. 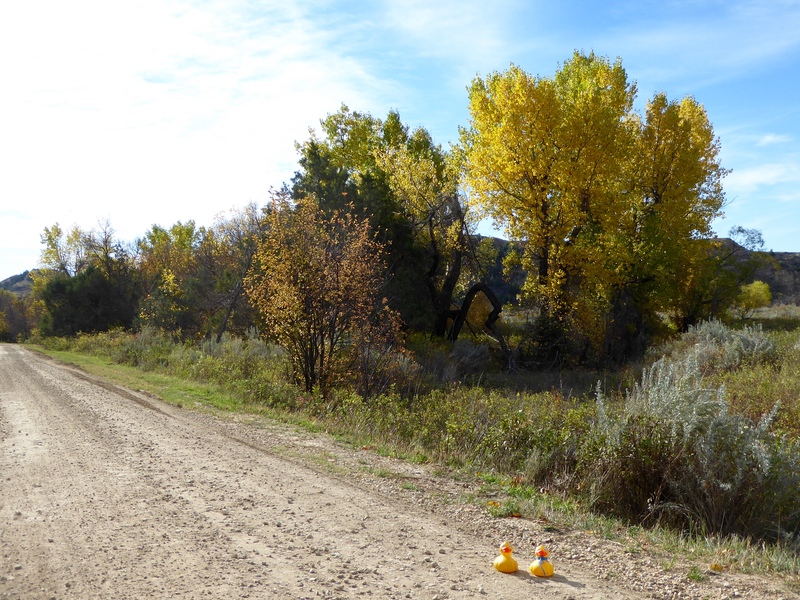 The sign said these are Cottonwood trees, dark green jumpers and dwarf sagebrush. We ducks, like humans, enjoy seeing this beautiful, tranquil scenery. 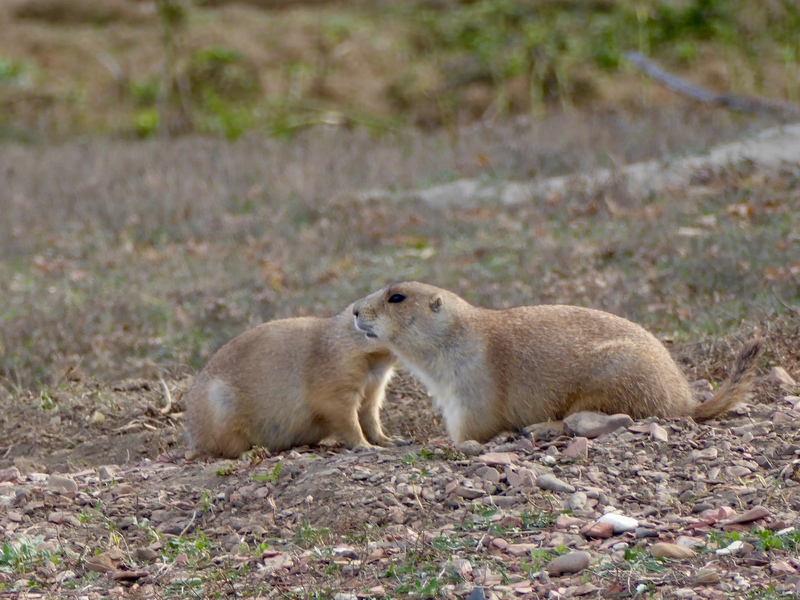 There are thousands of prairie dogs at various areas of the park. Prairie dogs. Talking about us? They are so cute. 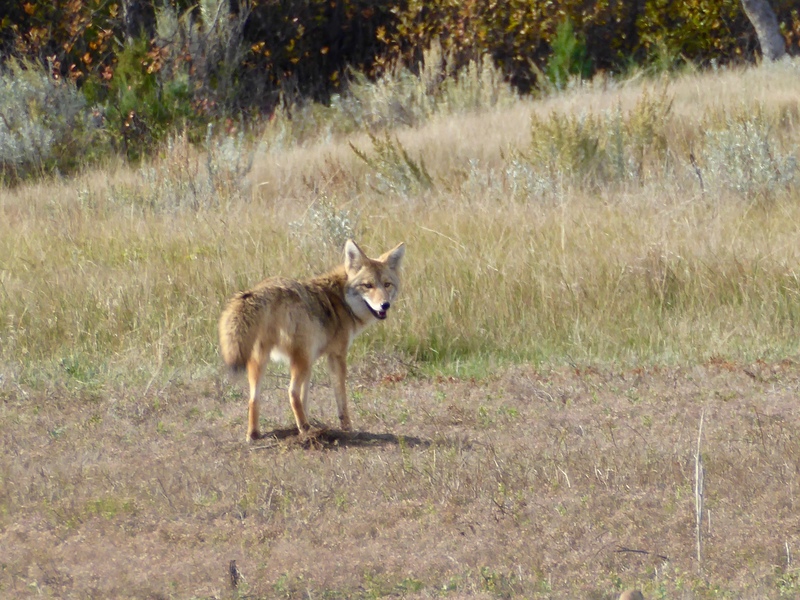 We do not want them in our yards, but we love to see them in parks. Oh no! This could be trouble. 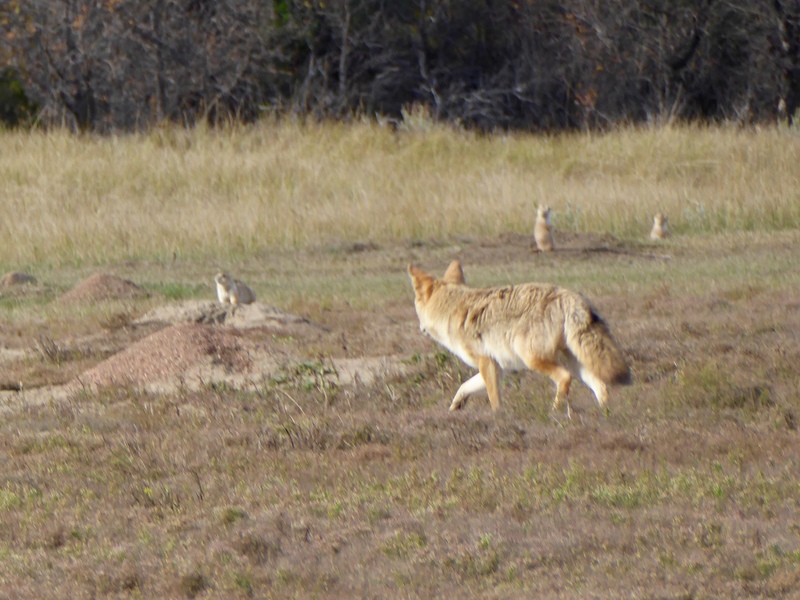 The coyote is walking among the prairie dogs. We hope it is not time for him to eat. Looks like he is saying, “I told you I was not hungry” Some of the road are paved, and some are not. We are fortunate that there is very little traffic in the park now. This area is known as Beef Corral Bottom. Years ago during the free range cattle round up, the cattle were brought here. Then the owners could check the brand and take their cattle home to prepare for sale. 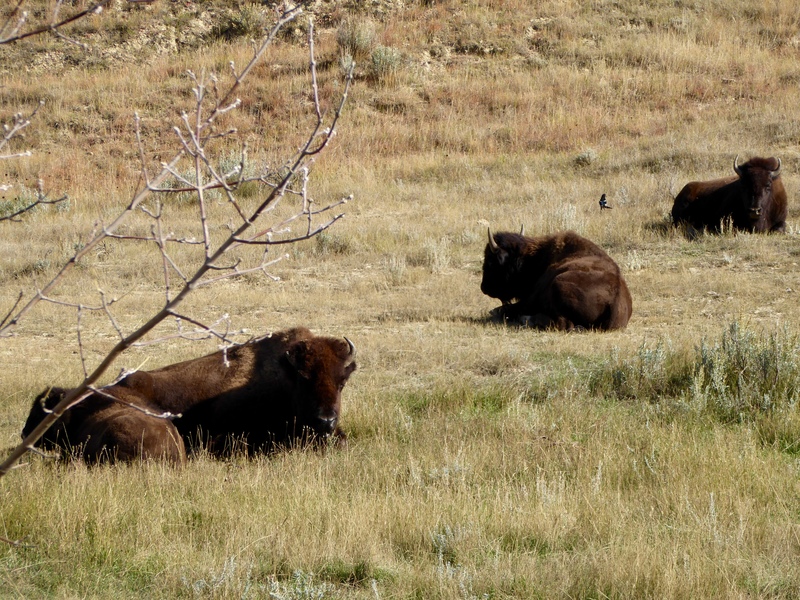 These buffalo are lounging by the side of the road. We did not get out of our car here. No reason to be foolish. This is the home of the buffalo, not the home of tourists. The color of the rock varies here. Whitish in some areas. Darker rock is other areas. We like the open lands also. The minerals in the soil effect the color of rocks. This lone buffalo stood on a hill surveying his land. He was so still at first, we were not sure if he was real, but he did begin to turn his head and walk away. Behind the Visitor’s Center, is the Maltese Cross Ranch House. 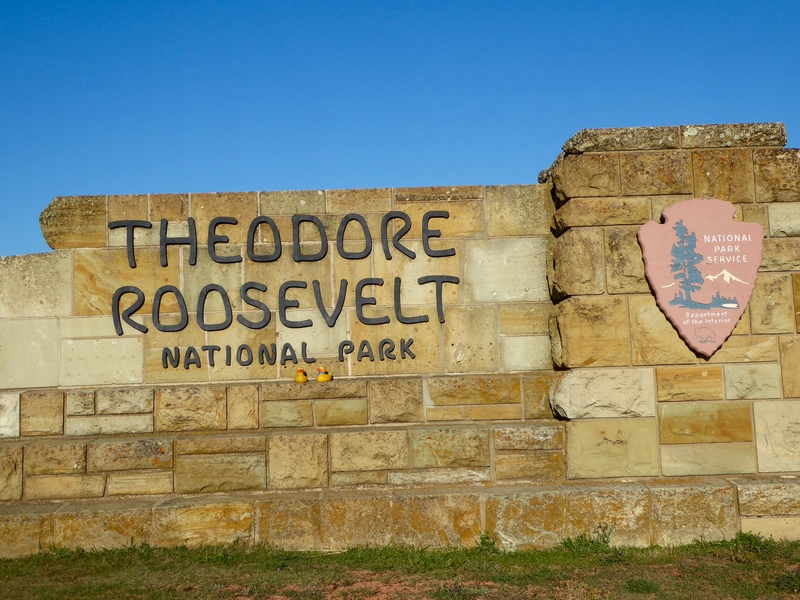 In September, 1883 Theodore Roosevelt part an interest in the Maltese Cross Ranch. 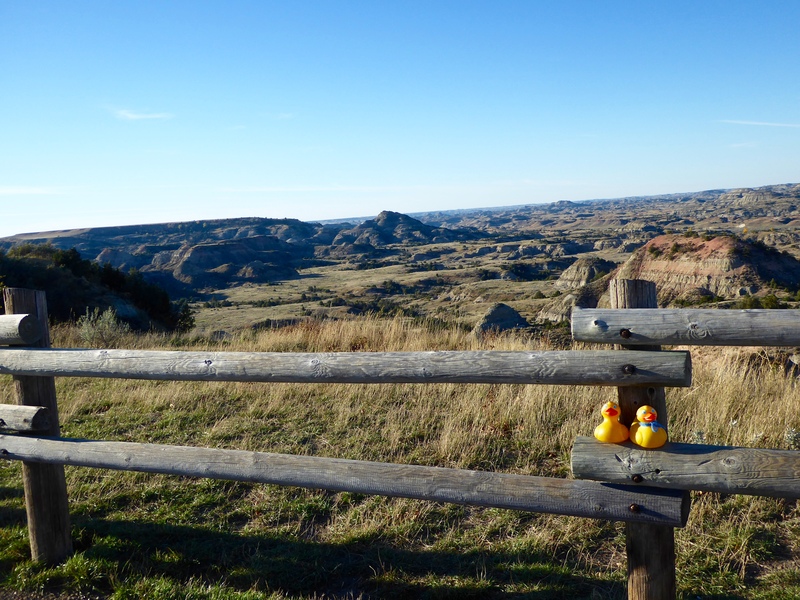 He loved the Badlands of North and South Dakota. The following winter his wife and his mother died with hours of each other. When the weather permitted, here came back to North Dakota and lived in the Maltese Cross Ranch House. Here he was able to find peace and renewed strength of spirit and body. 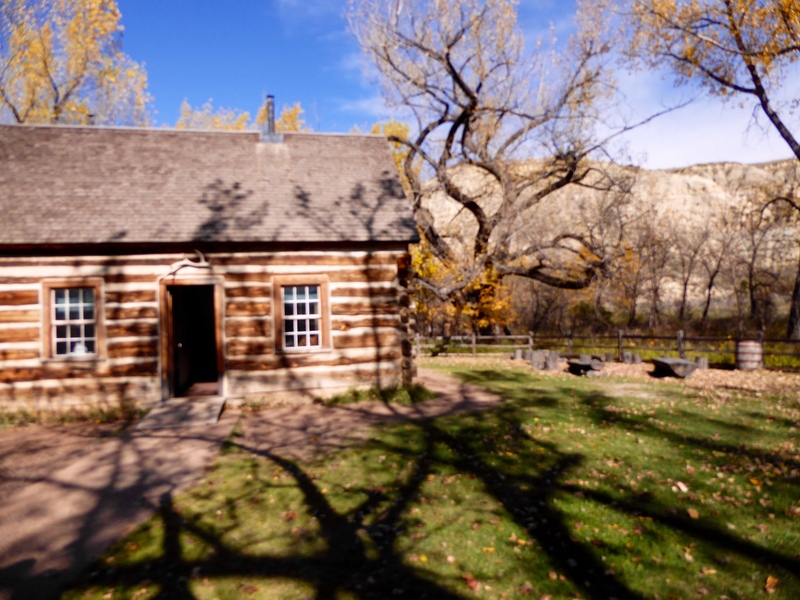 This ranch house was later moved to its present location in the National Park. 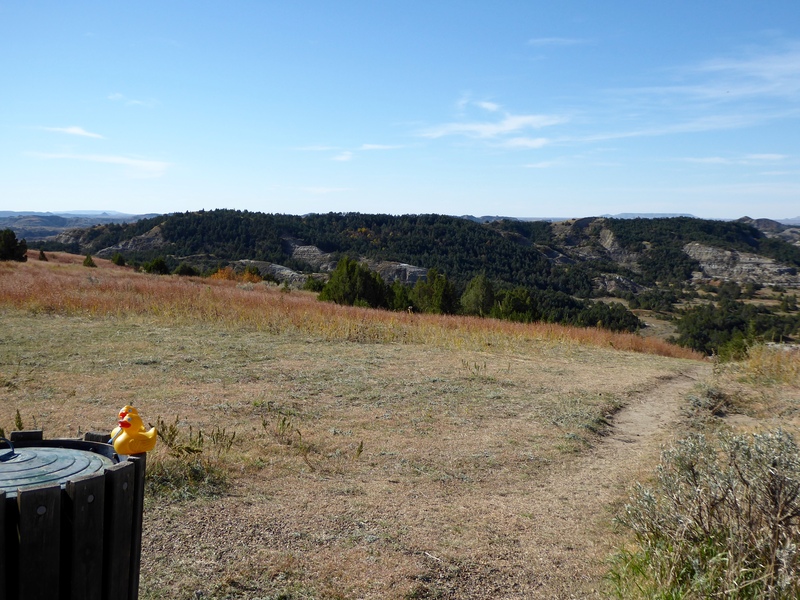 We hope you also have beautiful sunny weather when you visit Theodore Roosevelt National Park. 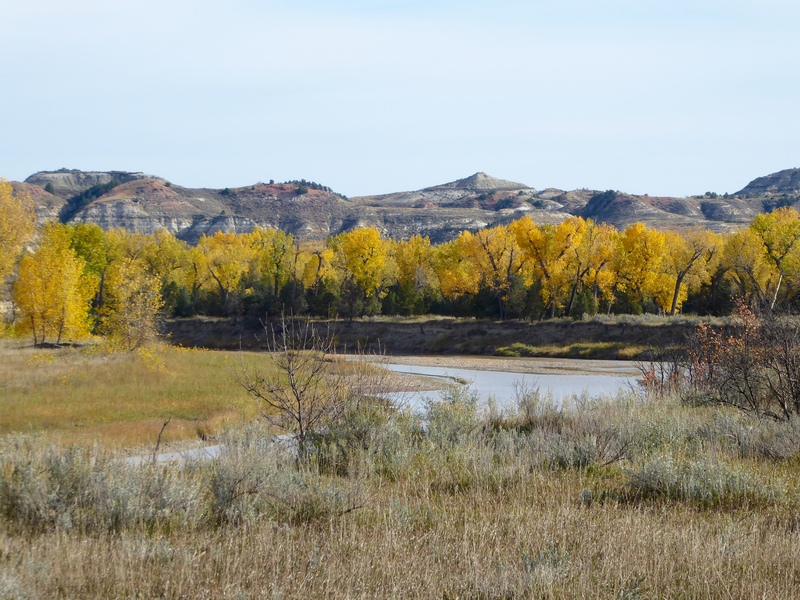 This entry was posted in North Dakota, Uncategorized and tagged Beef Corral Bottom, buffalo, Colorado Traveling Ducks, coyote, Little Missouri River, Maltese Cross Ranch House, North Dakota, Painted Canyon, prairie dogs, Theodore Roosevelt. Bookmark the permalink.